Revealing mistake: In the final shot of the film, Jill's head moves slightly when she's supposed to be dead. Continuity mistake: In the scene where Jill and Charlie are revealed as the killers, Jill is holding a knife to Sidney's throat and a gun in her left hand as she explains her motive. When Jill and Charlie are getting ready to stab each other, the shot changes and Charlie hands Jill the knife, even though she just had it in her hand pointing it at Sidney. Continuity mistake: When Sidney is in Olivia's room right after she killed, Sidney is holding onto the very bloody door frame, getting a little on her hands. The next shot when she picks up the phone, seconds later, there is no blood to be seen on her. Revealing mistake: Just before Charlie is stabbed you can see the "blood pack" under his shirt. Revealing mistake: When Kirby is on the phone with Jill, as she approaches the "Stab fest" party, her iPhone is on the contacts list and not on call mode. iPhone screens are blank during phone calls when up against the ear. 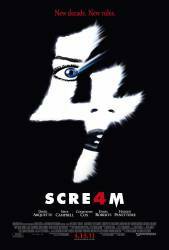 Continuity mistake: At the Stab-a-thon, the original music in scream 2's showing of "Stab" uses "Red Right Hand" as the opening credits. The burning popcorn shot happens a lot later, and there is a window crash sound early in the scene that shouldn't happen until later. When 'Casey' is asked by the killer "are you expecting someone? ", that's when she looks at the popcorn (which hasn't burned yet), and then she says "no". Continuity mistake: As Charlie and Robbie are explaining the rules, Rear Window is written on the board. In the closer angle Charlie is standing to the right (viewer's left) of it, then from the wider angle Charlie has suddenly moved to the left so the writing is to his right. There is not enough time for Charlie to move. Continuity mistake: When Jill stabs Charlie, the knife seems to make impact with his chest (directly in the middle). But then the close up he's bleeding from the heart (the right side of his chest, as we look at it). Factual error: In the scene where Robbie is at the front door of Kirby's house just before he is stabbed, he is watching a video on his DROID. However, the player controls are that from the iOS system (iPhone). Revealing mistake: Sidney rubs her hand down the door frame after Olivia is killed, yet the blood doesn't smear. Factual error: In the scene where Olivia's body is being removed from her home. Olivia was covered in blood, yet the sheet covering her has blood only in her chest area. The sheet would have had way more blood on it. Also, I'm an EMT, sheets are not used on victims that are dead. A body bag that zips closed and is made of rip proof plastic is used to transport deceased victims (especially if they are as bloody as Olivia was supposed to be). White sheets on a corpse are only seen in the morgue. Other mistake: In the film Dewey is called sheriff and has "sheriff" on his vehicle, however he also has "police" on his vehicle. Police officers and sheriffs are not the same thing. Continuity mistake: When Olivia arrives home at night, she rings Kirby as she gets out of her car and ends the call as she is unlocking her front door. Kirby and Jill have a very short conversation, and then Jill prank calls Olivia. In the space of less than five seconds, Olivia has gotten into her house, gone upstairs, gone into her bedroom, turned on the lights, and is halfway through changing her clothes by the time Jill rings her. Plot hole: Spoiler: I saw this with two nurses who pointed this out, so I know this is correct. The final sequence takes place in a hospital room in ICU. Jill pulled out IVs and electrodes that were attached to her, then proceeded to Sydney's room. She pulled the call button, then tossed Sydney around the room. Glass shatters. She knocked Dewey out with a bedpan, fired a couple of shots from a gun, and yelled at Sydney, Gail, and the deputy. Sydney even fired the gun at one point. All of this goes on for quite some time, making a hell of a racket in ICU. The problem? The medical staff and security. Any nurse at the nurses' station would have been alerted automatically when Jill pulled the electrodes off herself, and also when the call button was pulled from the wall in Sydney's room. Within seconds there should have been someone come to the rooms to see why they were alerted, but the only time you see a nurse was when Jill hid just inside a door while making her way to Sydney's room. One walked past on her way somewhere as if nothing unusual was occurring. The subsequent fight occurs and you still don't see any hospital staff. So where were they? Revealing mistake: After Jill's mom returns home from the store, she pulls a box of cereal out of the grocery bag and it is already opened. Continuity mistake: When Sidney and Jill are fighting, Sidney causes Jill's left eye to be bloodshot. But later its her right eye. Continuity mistake: The phone in Jenny's hand disappears when she is looking for Marnie. Factual error: Dewey wears a 6 point star badge but on his sleeve its a 7 point star patch. In any sheriff department its one or the other never both.